Mark: Have you done your visa application? Mark: Have you had your visa photos taken? Mark: Have you got the reference number for your visa? Mark: What have you been doing? I’ve been rather quiet on the blog. This has been for a number of reasons. Some are technical (I’ve moved to a new web host…blah blah yawn) but also, we’ve slowed our travelling right down. For the past 3 months I’ve been in countries I’m familiar with (Australia and New Zealand) as well as staying with family. I don’t quite feel I’m ‘travelling’; even though I am. It’s been an odd feeling. Sort of familiar, yet unfamiliar at the same time. Oh yeah….and this has been happening. A lot. Turkmenistan, particularly the capital Ashgabat, is a very odd place. I felt like Dorothy from the Wizard of Oz in the Emerald City. I kept expecting to see Toto pull the curtain back and reveal the former self-endorsed ‘President for Life’ Saparmurat Atayevich Niyazov (deceased) pulling levers and gears and bellowing into a megaphone. He was known by his self-given title ‘Türkmenbaşy’, meaning Leader of Turkmen. Bold. As vain dictators go, he’s pretty high up the list. There’s an enormous gold statue of him that revolves so it’s always facing the sun. A picture of it is above. To give you an idea of size, if you click on the photo, the two small sheds you can see at the front? They contain a guard each. I’ve mentioned before that without doubt anything I brought that had sat in the ‘dither pile’ when packing, was never used. But sadly, it doesn’t end there. I also brought things I was so convinced I’d use, yet still made no, or limited, use of them. Here, I’ll tell you about four items that I either didn’t use, or that didn’t work out and explain why. Oh dear. The number of hours I spent dithering over buying this makes me shudder. 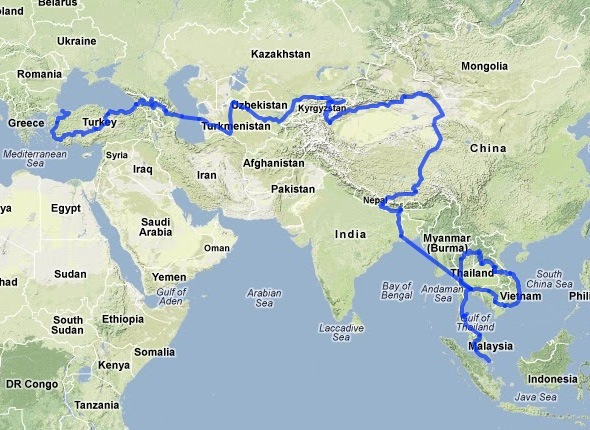 Overlanding through Central Asia into Tibet and on to S.E. Asia meant we would be travelling in a variety of temperatures. I brought quite a lot of Icebreaker clothing with me and on the whole they worked really well. Icebreaker gear is quite pricey so I knew I wouldn’t want to risk sending it out to be washed on a rock in a river. The Scrubba Wash Bag seemed the perfect solution. The Uzbeks like their tea sweet. Very sweet. You see hunks of crystallised sugar for sale wherever you go. You see it in huge, tumbling piles in bazaars, or in deep filled boxes in shops. It seems that by middle age most adults have a set of golden gnashers. It’s not uncommon to see them on younger people too. I think partly it’s the sugar, but it’s also a status symbol. When speaking, I found it hard not to be mesmerised by their golden mouth. When you’re used to seeing white teeth, the gold makes the mouth seem very dark. Many of the women in Uzbekistan, particularly in Samarkand, wear wonderful, colourful dresses. Sequins and diamanté are stitched into the pattern, it shimmers in the sunlight, dazzling your eyes. I felt very dowdy and underdressed in my quick-dry t-shirt and walking sandals. Not at all feminine. Some women sport a fetching monobrow. I asked our guide, Bek, about it. It’s Tajik fashion and apparently it’s drawn on, though on some it looked very authentic. I even saw one on a two year old girl. I’m assuming it was drawn on…but you never know! The overland trip would take six months. It starts in Turkey and finishes in Singapore. One third of our time would be spent camping. However, it’s hard to camp much after Kyrgyzstan, so little camping would be done after this country, just a few nights in Tibet. So really, we camp 50% of the time until we enter China. Food in Malaysia is good. Very good. It’s cheap, plentiful and freely available freshly cooked on the street. Yet we often chose to eat in food courts in shopping malls. I’ll explain why. Pick and choose what you want. Though I have no idea what happens after that!